critical comments . 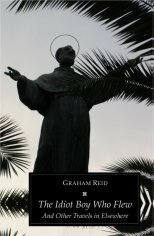 . .
A new collection of travel stories by Graham Reid and a follow-up to the award-winning Postcards From Elsewhere. Available through Elsewhere or Public Address Books. Travels and encounters in odd corners of the USA, Asia and Europe, unexpected places discovered and the title story about a journey into southern Italy in search of the birthplace of strange saint who flew. "as delightful as you'd expect from such a skilled storyteller . . . trademark anecdotes about fascinating characters . . . the title story about a simple saint whose faith allowed him to fly, demonstrate(s) the treasures to be found as a result of doing a bit of research and exploring off the beaten tourist track . . . marvellously accurate snapshots of people and places from elsewhere; pictures in words which amuse and inspire, entertain and inform". REGRETTABLY -- BUT HAPPILY -- BOTH OF THESE BOOKS HAVE SOLD OUT, HOWEVER MANY OF THE STORIES IN THEM HAVE BEEN, AND ARE BEING, POSTED AT ELSEWHERE FOR YOU: SEE HERE.